There’s a new hero in your bathroom. 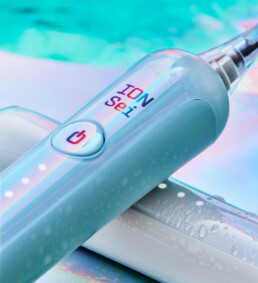 Whereas most electric toothbrushes only remove plaque and bacteria, ionic technology suppresses the bacteria causing plaque too. You’ll experience smoother, cleaner feeling teeth over time. And can expect a healthier mouth with less risk of cavities. Innovative cleaning through patented ionic technology. Gentle-on-gums 31,000 strokes-per-minute sonic vibrations. What inspired us during design was to make this toothbrush a tool for healthier life as well as a healthier mouth. 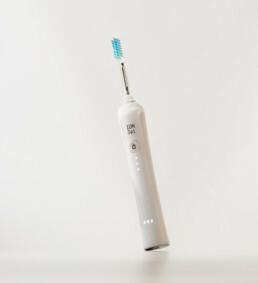 The ION-Sei is ergonomic, bringing a light and delicate touch to brushing—you can really feel it will work differently. We believe, true to the Japanese way of thinking, that mouth care directly relates to being healthier and happier in body and therefore happier in your life. 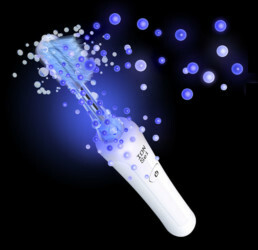 ION-Sei is a new innovation in brushing, giving a deep and gentle clean charged with ionic superpowers. For more powerful thinking on mouth care—plus to become part of our first reviews on the product, or for special offers and new store list, give us your email address. We’ll never share it with anyone else. *All ions shown are for illustrative purposes only. Ions are not visible to the naked eye.